1. Changes should be informed by customer feedback, surveys and groups, giving particular weight to requests from away from the railway which can encourage traffic not previously catered for. Business decisions to trade off better service for existing passenger flows versus serving new flows which are screaming out for resource in order to be served at all may be needed. 4. Connectional journeys are important! 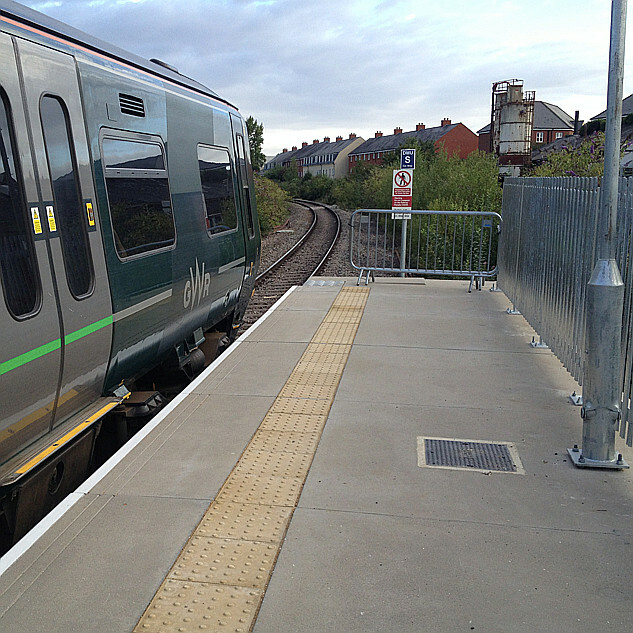 Connections to and from other operators of trains and buses are important too. We're looking at total journey. 5. 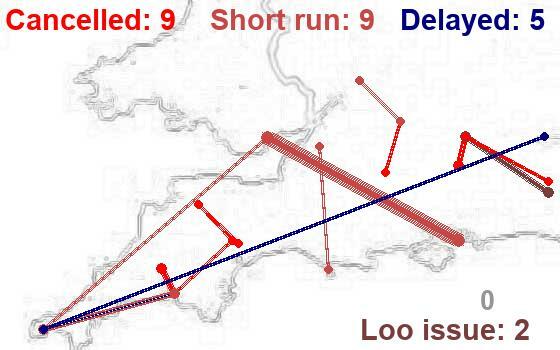 Robustness of timetable and connections in preference to speed. Saves agro, saves taxi fares! Robustness applies to not only the trains themselves but also the staff to operate the trains, 7 days a week, and to have principled contingency plans to minimise customer delay minutes. 6. Most local and regional journeys are return ones; make sure they work both ways. If you have to choose to make one excellent connection in preference to another southbound, make sure you do the same northbound too. 7. Clockface if you can. Regular if you can't 'clockface', but can manage regular. And keep the stopping pattern regular too. Firebreak allowed with care. Where two services serve the same flow, they should be clockface or at least regular when interlaced. 8. Look carefully at start and end of service. Remember that a quiet final train isn't just about passengers on that train - it's also about the same people when they make their opposite journey. And about being there as a fallback for people who can then be persuaded to catch the train before. 9. Look to the future. Leave paths where extra trains may be run later, and look at where development may be taking place away from the railway so that you're ready for it. 10. Identify underperforming stations - places where journeys per passenger in the catchment are low. see if there are lessons to be learned from a timetabling viewpoint. 11. Learn from stations that are performing well - make very sure you don't disturb their success. 12. Timetabling is about resources. Look to see if use can be made of a train that is parked in a platform or a siding for a lengthy period waiting to make its next trip. Is there time to fit in a journey with sufficient leeway it won't impinge on that planned next trip? 13. Will an enhancement to the timetable between A and C benefit your service but clash with an existing service at B? There's no point wrecking an existing successful journey opportunity unless you are confident there will be a significant net gain overall. 14. Link services together to make for regional through journeys rather than connections - linking major urban centres as stated by a principle from key industry players at the TWSW / DfT / GWR event on 3.7.2017.. But at the same time do so only where the length of train / stock type required doesn't vary dramatically between the joined route parts. 15. Embrace your customers. Listen to their views, explain what you're doing and what you're not able to do. Take them into your trust. Work with the communities - be they informal or CRPs and let them help explain what's happening in good time to your customers. In light of comments away from this board ... these guidlines are limited to timetable change within boundaries of specified stock levels and their technical implementation. The are not intended to induce changes to principle service pattern specifications, nor are the looking at how best to explain them / publicise them to new customers - important though those aspects are, they are outside the remit of this discussion. One thing about customer feedback and in general listening to your customers, is that it only tells you what your current customers think, and usually only a vocal minority of them. To expand the service you need to reach potential customers as well. Couldn't agree more. Which is where the great & the good that were 'spouting off' at that meeting were so wrong - it was *so* obvious where they hadn't done that - especially over XC wishes. Not a clue who was using it, and who might use it, or even what it was for. Point 8 regarding last trains is IMHO seldom properly considered. There has been, and may still be a view that last trains "don't really matter because so few people use them" A lot of customers avoid the last train for fear that it wont run and that they will be stranded. Removing the lightly loaded last train, means that such cautious people now avoid the NEW last train. I recall a particulary bad example of this (many years ago) on the Waterloo to Exeter route. The last up train from Gillingham terminated at Basingstoke, with a very long wait for a very slow connecting service to Waterloo (A fast train to London departed just before the train from Exeter arrived) presumably to discourage use. The connecting service sometimes failed to turn up, or left unannounced from a different platform so as to strand passengers at Basingstoke. If not already holding a ticket, one had to pay on the train from Gillingham. There seemed to be a policy of only selling a ticket to Basingstoke on the grounds that the train terminated there. If stranded at Basingstoke, the conversation might go "I wish to travel to London, can you arrange alternative transport"
"May I see your ticket please"
" it says Basingstoke on your ticket. You are at Basingstoke, so what is the problem"
The train was removed from the timetable due to lack of use. I suspect it'll never be released for commercial reasons, but I would love to see a sample dataset of queries that people make online with National Rail Enquiries. Where do people actually want to go? What journeys do they want to make, and how well does the current rail network (and timetable, and fare system) respond to their needs? To take an example from another thread, would it show lots of people looking for a late-night train from Stratford to London? Are there flows that could justify a new direct service (I've always wondered about Evesham/Pershore direct to Birmingham)? How about journeys where people look up the prices, but a smaller proportion than usual click through to purchase, perhaps because the fare is too exorbitant? You'd have to treat it with the appropriate degree of caution, because a lot (maybe most) of NRE users are looking for journeys they already know they can make, but it would be fascinating and perhaps very useful data. Far from being little used, the last trains I have used have often been incredibly overcrowded. The last stopping service from Bristol to Bath which goes on to Frome is often absolutely packed and very raucous with people on their night out. Out of our region, another last train I've occasionally used is the one from Nottingham to Mansfield, which must rank as one of the noisiest trains there is, as everyone on it seems to know everyone else (or at least they do by the end of the journey ) and is intent on making the whole service into one drunken party. Relying on surveys and focus groups doesn't tell you about the types of customer you're not reaching and why you're not reaching them (let alone the journeys they would be making). Surveys tend to be completed by people with reasonable education, letters (including emails and tweets) even more so. If you look at the make up of those attending information meetings organised by TOCs, or groups like FOSBR or even, I suspect, this forum, they tend to be rather homogeneic: middle aged, middle class, white men (and slightly geeky too!). So where are the, for instance, young, working class, black women? Maybe they're simply not travelling by train (why not?) but maybe they're on the train and you're not hearing their views? No doubt SOME, young, working class, black women do travel by train, but my own admittedly imperfect observations seem to suggest that black people are less liable to use trains than white. When I lived in London a significant proportion of my neighbours were black, yet very few seemed to use the trains. Most of the passengers on local busses were black. It did seem to be a cultural thing, and perhaps also financial, bus fares being generally cheaper than rail for similar trips. The difference was however small, and even black neighbours whom I knew to be well paid always took the bus. On the TransWilts work, we have been (and remain) so much aware of these issues, and general listening forms a qualitative indicator front those who have thought and communicated and not a quantitative measure. On train surveys, handed out on every train in the day and collected back by volunteers for each and nearly every group traveling (only 1 in 25 forms not collected), and weighted to take account of the group size, give us numbers. A stall set up at one of Melkshams' three annual events - Party in the Park, Carnival and River and Food festival, with a couple of quick survery sheets where people can tick boxes, gives us an idea of why (or because of what perception) people are not using the trains - an the metric of people attending these events is far different to the metric of those you'll see at town hall meetings. Again, 100% agreement with your comment (and thanks for the example). If I have an important meeting to get to, I will travel on a scheduled service one before the one I need to be on. And I will try to avoid the (very) last service - it's important to me to get home or to a hotel I'm booked into. Case in point yesterday - an appointment in Bristol, 2nd train should have been fine. On the way in, I took the first train though, and thank goodness did because the second train was cancelled with a gap of over an hour to the following one.Time not wasted - picture at base shows what I did. There were eleven people booked in my main Bristol event (a course I was attending); only four of us had arrived by the time it was due to start; five more trailed in with travel-woe apologies up an hour late ("Temple Meads" within most apologies) and two were no-shows. This was NOT a travel meeting to provide bias, but nearly everyone was from across the greater South West. On the way back I arrived at Temple Meads at about ten to five, and would normally have caught the 17:00, change Swindon, into Melksham at 18:03. Not to be - got to Melksham at 18:47 - different story, but again an indication of the danger or relying on the last train prior to an appointment; if I had had an 18:30 Melksham meeting, would have made it if trains were running normally but not last night. Further follow up to come on crap information available and provided to me at Bristol Temple Meads. Some last trains are very VERY busy though. Noted the last train to Frome from Bath, and others mentioned in this thread too. They tend to be very busy towards the end of the week; quiet(er) on Tuesdays for example. And they tend to be used for relatively short journeys from major operating points with no change requires. The age, gender and ethnic mix of passengers differs enormously from the age, gender and ethnic mix of people answering surveys or attending meetings to look forward. And the mix may differ too from the mixes of the areas served. The "why"s and "how"s are interesting and potentially very important everywhere from considering discriminations through to looking at customer bases and barriers to developing customers, and all I have (on a pure TransWilts basis) is a gut feeling and no numbers I could reliably quote. And my gut feeling in an area that's predominantly white British is that "our" trains are actually a far more cosmopolitain mix than our neighbourhoods.